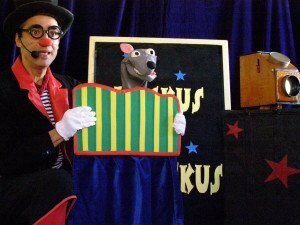 Ruskus wears black tie to deliver first-class entertainment! The Circus Family Show is the perfect choice for special occasions, such as first communions, christening celebrations, and weddings. When the children finish their meal (invariably before grown-ups do), Ruskus Patruskus is ready to make them have fun! Indeed, the Circus Family Show is an endearing children’s performance created to be equally enjoyed by kids and grown-ups. The enchanted camera in action. Some acts of the Circus Family Show go back to the golden age of vaudeville, such as the art of transforming a piece of cloth in different hats. Other numbers were already performed centuries ago by acrobats and jugglers. Not to mention some classic clown skits, like the haunted hand or the invisible mirror. In short, the Circus Family Show is an authentic fair of wonders that will delight all your guests! Show’s title: Circus Family Show. 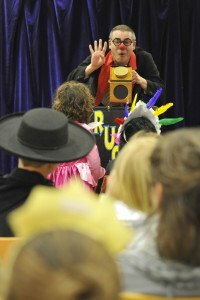 Play’s genre and subject: kids’ show about the circus for children’s parties and family receptions. Language: Catalan. Also available in English and Spanish. Performing space: any place with a minimum surface area of 3 x 4 m. It is suitable for both indoor and outdoor celebrations. Sound and equipment: a 20 W battery-powered amplifier is included (not so a microphone, a platform or lighting). If needed, a 250 W PA system with wireless microphone is available at no extra charge. Set up and strike time: set up 30-45 min, strike 25 min. (Performances with PA system: set up 1 h, strike 30 min).